Perhaps not surprisingly, the short answer to whether or not your small business needs a backup solution is a resounding YES! Small businesses, in particular, are subject to a growing number of threats. The biggest? Ransomware. Security solutions work hard to keep up, but these solutions can only go so far to keep your business safe. Outside threats aren’t the only thing putting your business at risk. Human error is another common cause of data loss. Networks also go down for a variety of reasons beyond just floods and fires. This can unfortunately cause data loss. And since your company can’t make money if your employees can’t work, time is truly of the essence when it comes to getting your data back. It’s virtually impossible to protect yourself from every threat. Without your data, you could lose everything you’ve worked so hard to build – accounts receivable, customer information, processes, procedures, etc. The list goes on and on. With a good backup and disaster recovery plan in place, if there is a breach in your business intelligence, you can restore your data to a past point before the attack, recovering the bulk of your data. You’re convinced you need to back up your business data, but what specifically do you need to protect? In an ideal world, you’ll backup everything in your business. Sometimes this is a little more than your small business can take on right away, and that’s okay too. As long as you’re backing up all of your critical data – the data you couldn’t live without or recreate – you’re still taking necessary steps to protect your business. Financial records, customer information, and sales data are all on the list of “must include” when you’re deciding what data to back up from your business. As you start to research your options, you might find that you’re overwhelmed with how many choices are available to you when it comes to small business backups. Here are the basics you must consider when finding the right solution for you. A backup done onsite is a backup that’s stored on a separate piece of hardware at your business. Note: If you’re still using tape backups, it’s time to make a change. These are very outdated and ineffective. Current hard drives designed to keep data safe are ideal for onsite backups. 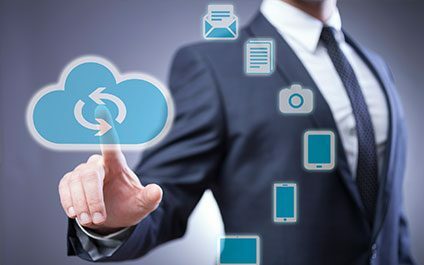 If a backup is done offsite, your information is transferred through the cloud (or through your Internet connection) to a server in another location. It’s recommended that you have both onsite and offsite backups. By having an onsite backup, you can immediately recover your data. This instant access could save you time and spur your productivity. An offsite backup is equally important because it’s always best to have a Plan B. If something physically happens to your office, or your onsite backup somehow gets misplaced or tampered with, you have a fallback plan in place. It’s rarely recommended (if ever) that you rely on a manual backup. You’re busy enough as it is. Having to add the task of updating your backup on a daily basis is not realistic. By having an automatic backup, you can ensure your data is transferred safely and securely on a regular basis. To start, you’ll do a full backup of all of your data. Then, once that’s in place, the backup program will make updates incrementally whenever changes or additions occur. With automatic backups, you’ll need to decide how much information you can’t live without. Then, you’ll also need to determine a time period in which you’re willing to lose this data. You can set your backup solution to capture changes daily, hourly, or even every 15 minutes depending on how quickly your data is changing. It’s recommended to have a daily backup as the bare minimum and to keep 30-days of daily backups since sometimes, you might not notice that your information is gone for awhile, believe it or not. The industry-wide recommendation is to conduct an image-level backup. An image-level backup means you’ll backup the entire system (both physical and virtual) by taking a snapshot of every byte of data. Nothing is overlooked. Nothing is missed. All of your software, information, and configurations are captured, just like they would be if you took a picture of your current setup. When it comes time to restore your data, everything is brought back online exactly how you had it before disaster struck. Just like you encrypt sensitive financial information when you send it to the bank, you’ll want to encrypt your data every time you back it up to your onsite and offsite servers. Encryption keeps it safe and out of the hands of hackers who could use your backup to gain access to your business intelligence. Encryption is your safeguard here. It’s important. When deciding which data to backup, you’ll need to also take into consideration whose data to backup. For some employees, it’ll be important to backup their actual PC. This will mean that any data not stored on the server will still get protected against disaster. For example, the documents, software, and the overall configuration of your computer are important. Backing up this data will help you restore everything quickly if disaster hits. Proper small business backups are the ultimate failsafe against loss. No matter what goes wrong – ransomware, viruses, employee error, rogue employee actions, fire, flood, etc. – you can always go back to the way things were before the loss.